Telaya’s tasting room is designed to encourage conversation, leisure, and most importantly, enjoyment of our wines. Positioned along the Boise River and the Greenbelt and next-door to the Riverside Hotel, we offer an inviting space to savor old world-style wines. 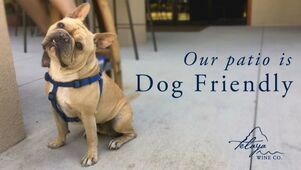 Our patio is dog-friendly, includes an above-ground fire pit, and is open daily. Our tables are available on a first-come, first-served basis. Feel free to bring a picnic or snacks to enjoy with your wine. If you ride your bike, we have a bike rack available for your use. We do have limited parking so if the parking lot is full please feel free to park in the Riverside Hotel lot or find additional parking along 32nd Street. You can find more information about our wine menu and what to expect during your visit here. If you're coming in to the winery with a large group, we'd love to have some advance notice! Tables are available on a first- come, first-served basis. If you'd like ensure your group can enjoy our wine together, please contact us to learn more about our private room! DON'T MISS OUT ON IDAHO WINES. Family is the foundation our winery is built upon. In order to give our employees time with theirs, Telaya is closed on the following holidays.